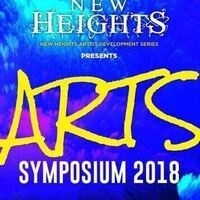 The free Arts Symposium is part of the annual New Heights Artist Development Series. Artists of all skill levels and experiences are encouraged to attend the day-long educational conference to advance their skills and career. Opening remarks and keynote addresses will begin at 9 a.m., but be sure to arrive early for a free continental breakfast beginning at 8 a.m. The Symposium will present three focused panel groups, for a total of nine sessions, on an array of topics from the cinematic, musical and visual arts. - 9:45am - You Have Made a Film; Now What?